There’s a happy ending though. A dog in Detroit spent one whole month waiting for his owners who weren’t coming back. 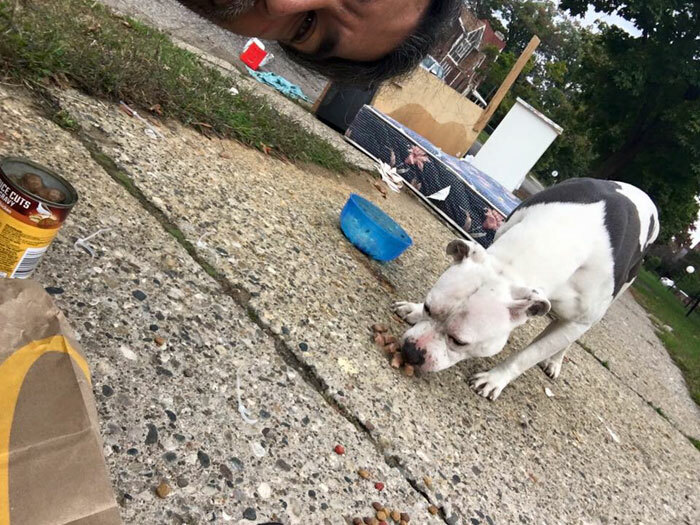 The family moved out of their home and left a pile of trash behind, including their loyal pit bull Boo, who spent days sleeping on an old mattress. According to neighbors, the depressed pup accepted food and water from them, but refused to budge. Soon enough, they contacted Detroit Youth and Dog Rescue Center, and founder Mike Diesel decided to pay Boo a visit. When Diesel arrived, the beautiful dog was there, in his usual spot. He says: “He was just lying there, being his loyal self. Being the loyal dog he was supposed to be, he waited for his master to come back.” Boo was standoffish at first, so Diesel knew he needed to take things slowly with the heartbroken pup. Diesel stayed with the dog for 11 hours, feeding him tasty snacks and keeping him company. He returned the next morning with McDonald’s breakfast: two sausage McMuffins and two hash browns. Slowly, but surely, Boo recognized Diesel as a new friend, and allowed him to place a collar on him. He says: “We just had a conversation, me and Boo. I told him how this is going to go, how he’ll never be hurt again.” At the moment, the beautiful pup is being treated for stage-two heartworm. Diesel says that Boo will live with a foster family during treatment, and as soon as he’s better, Detroit Youth & Dog Rescue will find him a local forever home.